Asanbar is one of the leading manufacturers of computer software for the transport industry. Our software and website serve, first of all, drivers and owners of motor vehicles, allowing them to carry out more rapid communication among themselves. Thanks to our products, thousands of transport operations are carried out daily in Iran. It is very easy to use the Asanbar software. Businessmen and transport companies post information about themselves and their products, and the owners of vehicles, depending on the characteristics of the goods, offer transportation tariffs. Delivery of the goods takes place after mutual arrangements. Thanks to our software you can make transportation calculations, submit necessary documents and discounts, send information about the cargo to various transport companies, etc. Our main goal is to help consignors and cargo carriers to find the most favorable conditions for cargo transportation, including to other countries. For the convenience of clients, we provide an opportunity to pay for services by any means. Recently, we also have a representative office in Canada - Freightgram. We are very pleased with our participation at Bakutel and with the overall organisation and scale of the exhibition. We are also happy with the meetings and negotiations we held. 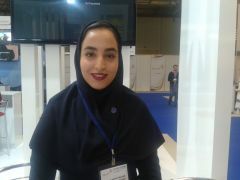 It was very pleasant that our stand was visited by the President of Azerbaijan, the First Lady, the Minister of Communications and Information Technologies of the Islamic Republic of Iran and representatives of well-known international and local companies.